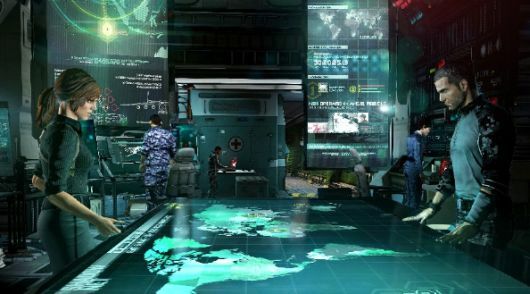 "I'm not going to go into the whole story," says Splinter Cell: Blacklist creative director Maxime Béland during an interview with Joystiq at PAX 2012, "but Conviction was kind of a rescue job for me." As the last game in the Splinter Cell series (that also served as a more action-oriented reboot), Conviction ended up doing fairly well at retail. But Béland says that he and another producer were "brought in because it wasn't going well. We changed the direction and kind of shipped the game in two years. So Conviction is very sweet and sour for me." Soon after Conviction's release, Béland says he and his team sat down to put together a spreadsheet, going through over 80 reviews of the game and marking out what features were most mentioned, and which were most positively or negatively received. The black-and-white graphics during gameplay weren't well liked, so this past E3 when Béland announced Blacklist, one of the first things he said was that black-and-white was out. Players felt the single-player part of Conviction "was too short, and the scope of the game wasn't big enough," so growing the world of Sam Fisher has become a priority for Blacklist. And the least-liked feature of Blacklist? Fans really missed the spy vs. mercs competitive gameplay mode. That's why for Blacklist, it's implemented right back in there. "Easiest decision of my life," says Béland. Conviction wasn't all bad. Béland calls it a "stepping stone," and says it set a more action-oriented tone for Sam's stealthy adventures that fans responded to well. But the goal with Blacklist isn't necessarily to go further. Béland wants Blacklist to incorporate both kinds of playstyles, and more. "We have these three player profiles, player archetypes in our heads," he says. "We have the ghost player, that doesn't want to kill or get detected. We've got our action/tank/killer player on the other end of the spectrum, that just wants to throw frag grenades, blind fire, shoot people in the head. And then in the middle, we have what we call the panther." The panther is what Béland calls "clean, tactical" action: Not full stealth, but smooth and quiet action gameplay. "So we're building the game with those three archetypes in mind." Ubisoft Toronto will make sure all three player types are covered in a few ways. First, Sam's equipment is upgradeable in Blacklist for the first time, and every time you change out one of the five things he's wearing, the game will change as well. Wearing a certain gadget, for example, might make your guns more powerful (leaning towards the action side of things), or make you quieter while moving around (for stealth). "So you're really going to be able to mix and match different parts of suits to make your own Sam," promises Béland. And the team is also planning to create very different approaches to the same situations - Béland's already shown that in the E3 trailer that features a more action-oriented approach, and then in the ghost trailer released a little while ago that's focused on stealth. The team is planning to make sure that at any time during the game, players can choose their own paths, and the chosen tactics will work either way. Béland won't guarantee, however, that stealth junkies will make it through the game without killing anyone. "I'm not going to tell you, but I know exactly how many moments you're not going to be able to play stealth," he says. There will certainly be times in the story where Sam's tale takes precedence over any narrative the player's trying to put together. But Béland also understands that players want to play, not watch a movie. "We've minimized those as much as possible." Béland does confirm, as well, that though his voice and appearance will change in Blacklist, this is the same Sam we've known all along. "The game takes place about six months after Conviction," he says. At the end of the last chapter, Sam didn't seem too inclined to go back into government work, but Béland says the team has come up with an appropriately personal crisis to get him back into the swing of things. "You're going to see in the first half hour of the game where it's not just the President coming to Sam and saying 'I need your help yet again' ... We've made it very personal for Sam." There may be more Splinter Cell on the way as well - through the disapproving looks of the PR person in the room, Béland teased that "we're going to be also doing some exciting stuff in the gap between the two that's outside of the game," so there may be some tie-in material coming soon. And then when the game finally releases, Béland says he's doing his best to really pull Blacklist together, and create an experience that captures what fans have loved and fixes what fans have hated about this series in the past. "We're making a much bigger singleplayer story, co-op, spies vs mercs," he promises. "And blurring the lines between all of these modes, I think, is going to make this a huge game."